Posted on April 23, 2012 by C.E. We’re boldly delving into our ever-growing stacks of cookbooks, seeking out recipes we’ve never made before. Prepping the ingredients for Punjabi Curried Kidney Beans, or Rajmah, a hearty Northern Indian dish that’s perfect for the slow cooker. Unlike so many born-in-the-’70s kids with working parents, I didn’t grow up with a Crockpot on the kitchen counter — on busy weeknights, my mom preferred to whip up some pancakes or rifle through our collection of takeout menus. I acquired my first slow cooker just a couple of years ago, when one of my friends pulled an extra one out of her cabinet and gave it to me. 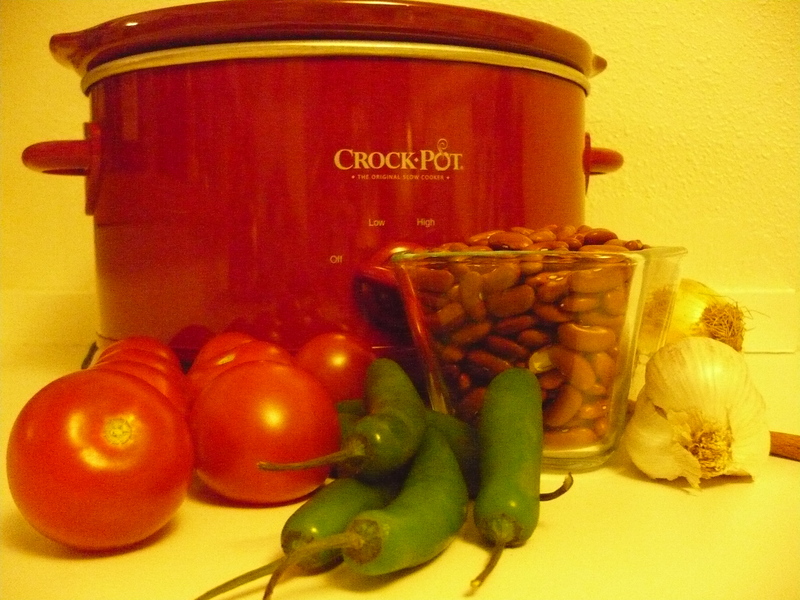 Since then, I’ve made quite a few chilis and stews in the slow cooker, and the Professor uses the device just about every week to prepare a big batch of soup. But we haven’t done much with our Crockpot beyond making those classic comfort foods. I’m an easily distracted cook who hates attending to a simmering pot of anything for hours, so a slow cooker, with its set-it-and-go simplicity, should be one of my most valued kitchen tools. I just needed the right enticement and the right recipes to encourage me to experiment. I found both in the form of a cookbook I recently picked up, “The Indian Slow Cooker” by Anupy Singla, the Chicago-based writer behind the blog Indian as Apple Pie. Indian food is another culinary delight I didn’t discover I became an adult, and for years I’ve wanted to learn how to make spicy curries and creamy masalas at home. “The Indian Slow Cooker” is packed with great recipes for all sorts of Indian dishes, from Chicken Tikka Masala to Goan Black-Eyed Peas. The cookbook also includes a guide to the spices, legumes and other ingredients most often used in Indian cooking. 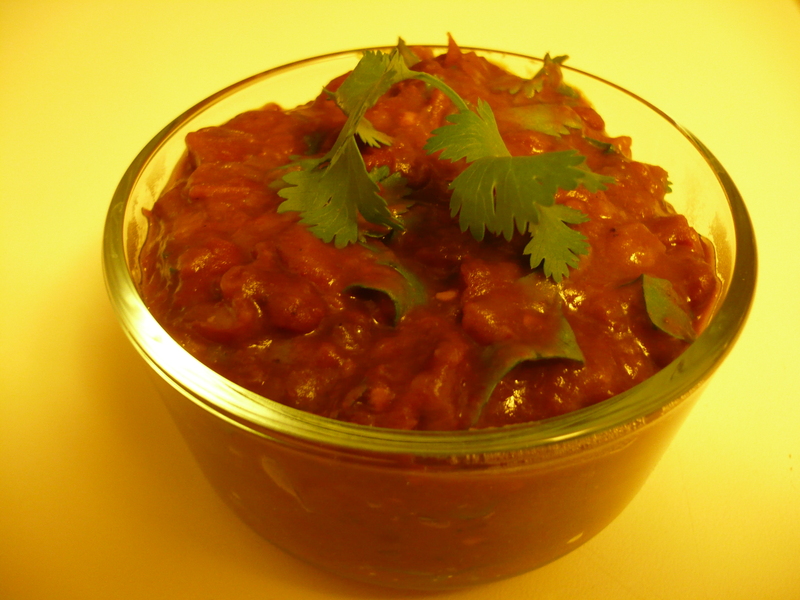 For my first attempt at making an Indian dish in the slow cooker, I chose Punjabi Curried Kidney Beans, or Rajmah. Singla points out that this dish is considered the quintessential comfort food in Northern India. That sounded ideal to me, since I’ve come to think of my slow cooker as the ultimate comfort-food maker. The recipe for Rajmah couldn’t be simpler: Chop some stuff, drop it all in the slow cooker and crank the heat to high; 11 hours later, give the Rajmah a few whacks with an immersion blender (another kitchen tool I don’t use often enough) and spoon out a rich, satisfying meal. If you’re looking for the Indian spices called for in this recipe (or any other dish) here in the Tallahassee area, I’d suggest making a stop at Little India, 1350 E. Tennessee St. In addition to spices and packaged goods, the grocery store also sells fresh and frozen Indian breads, including naan and paratha, that make excellent accompaniments to Indian meals. 4. Stir in the cilantro. Serve over a bed or basmati or brown rice with a side of raita and an Indian salad. Try this! After cooking, turn off the slow cooker and add 1 cup plain yogurt. Stir well and let the slow cooker sit with the lid on for about 10 minutes. This adds a unique tang. * To make this dish in a 3 ½ quart slow cooker, halve all the ingredients and proceed with the recipe. (I would suggest reducing the cooking time to 9 hours on high; that’s how long it took for the the beans to break down and become somewhat creamy in my 3 ½ quart Crockpot). Rajmah makes a satisfying main dish for lunch or dinner. Posted on April 16, 2012 by C.E. We’re sharing our favorite veggie-centric recipes featuring the produce that’s in season right now in north Florida, and available at local farmers markets, produce stands and Community Supported Agriculture programs. 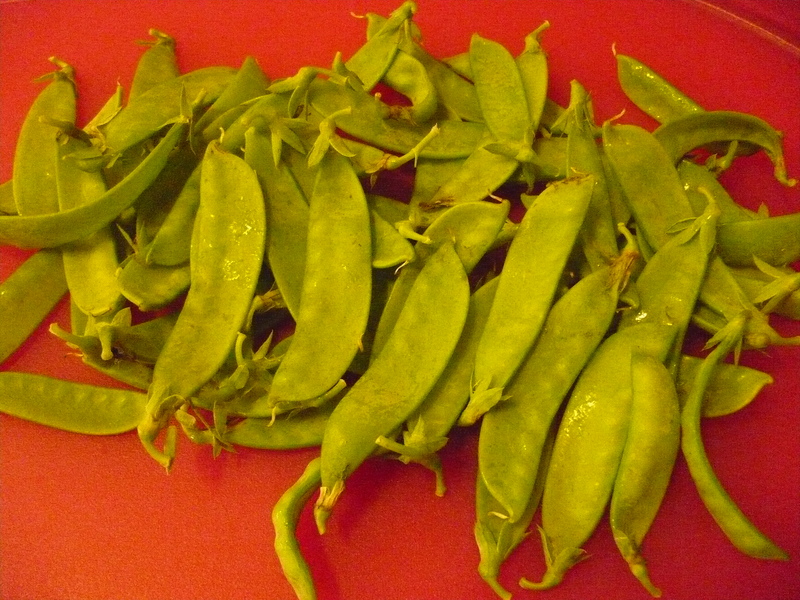 These fresh snow peas soon will meet their stir-fried destiny in the wok. Bite into a snow pea, and you will experience everything that is most wonderful about spring. A just-picked snow pea tastes crisp and green, delicate enough not to overwhelm your senses but robust enough to be memorable. We’ve been fortunate to receive locally grown snow peas in our Community Supported Agriculture (CSA) share for the past two weeks. Last week, we ate them fresh, in handfuls as a snack and tossed into salads. This week, we decided to put our snow peas at the center of a dinner entrée. Nothing elaborate, of course, since produce this fresh requires very little adornment and, besides, who wants to spend hours in the kitchen when the weather is so lovely? The folks at Full Earth Farm, who grow our CSA share, offered up the perfect suggestion. Their weekly email, in which they list the produce we’ll be receiving and update us on what’s new at the Quincy farm, also included a recipe for a snow pea stir fry. I’ve tweaked the simple recipe, adapted from Martha Stewart’s website, so it will be spicy enough for my chile-loving household. Feel free to use 1/4 teaspoon red pepper flakes, as per Ms. Stewart’s original recipe, instead of the serrano chili and Vietnamese chili garlic sauce I’ve added, if you don’t like your meals quite as fiery. We love to serve our stir fries on top of Asian noodles, such as soba or rice noodles; brown rice would be a great addition, as well. 1. In a small bowl, combine garlic, ginger, vinegar, soy sauce, and Vietnamese chili garlic sauce. 2. In a large skillet or wok, heat oil over medium-high. Add mushrooms and cook, stirring, just until tender, about 5 minutes. Stir in garlic mixture and cook until slightly reduced, about 2 minutes. Add shrimp, snow peas and serrano chili and cook, stirring, until shrimp are opaque throughout, 3 to 4 minutes. To serve, top with scallions. On December 3, Ryan (my boyfriend) and I won first place at Andrew and Heather’s 2nd Annual Chili Cook-Off! 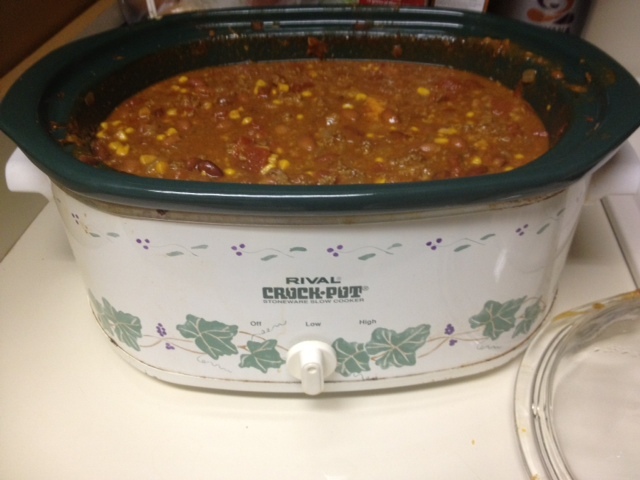 Our friends Andrew and Heather have a serious chili cook-off every year, so we were prepared to compete. They decked their house out in chili decorations, had t-shirts made and gave out chili-themed prizes. Last year, Ryan and I came in second place, so we felt the pressure, and wanted to beat it! *Side note: Ryan and I are both really competitive. Our first-place pot of chili. After the contest, everyone enjoyed chili, chili dogs and chili cupcakes. 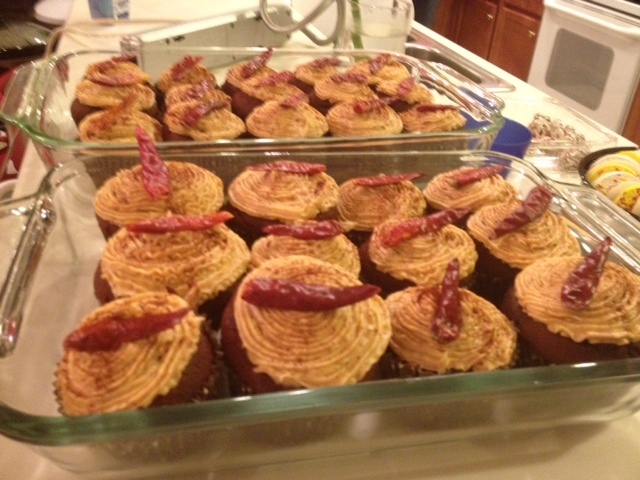 The sweet and spicy chili cupcakes were made by Candace aka Cakes by Candace. This fun night ended with a win and has left us pondering what to do for next year. Chili cupcakes made by the local baker behind Cakes by Candace. Thanksgiving week = crazy busy. With that being said, my cooking and veggie-centric recipe was kept simple. I picked up two ears of corn at Earth Fare for only 89 cents each! 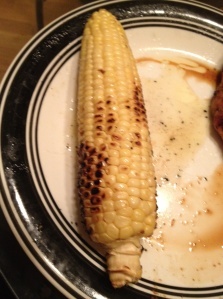 Fresh corn can be made into many things, but in my “keep it simple” state, I threw the corn on the grill. After about 15 minutes the corn was done, I put some butter and salt on it, and it was the perfect side dish! P.S. Since I was using the grill, I grilled two pieces of free-range chicken breast – also purchased at Earth Fare. I like getting my chicken from Earth Fare because they disclose the farm it came from as part of their 100 mile radius commitment, which means they are committed to purchasing from farmers within 100 miles of the store and will not label anything “local” unless it came from within 100 miles of the store location. I marinated the chicken in soy sauce, garlic and honey for one hour prior to grilling … it was delicious! !